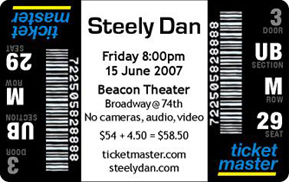 I'm in New York and I have a ticket to the Steely Dan concert. I had bought the ticket earlier in the spring thinking it would be a real hoot to be at a concert of a group that I enjoyed in the 1970s. It was also at the Beacon Theater, a beautiful old theater on the Upper West Side. Leaving the apartment for the subway, I wanted to put the ticket in my wallet - I wanted it to be safe. Bit it didn't fit, I had to fold it in half. 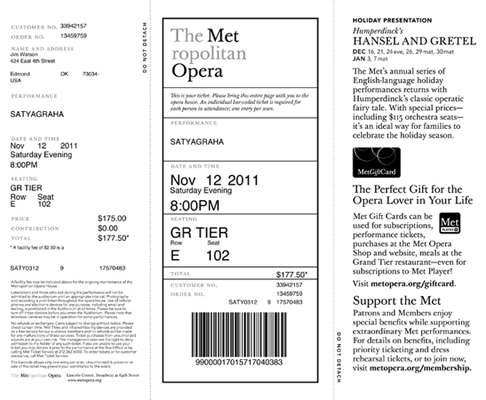 I got to thinking - why can't tickets be the same size as the MetroCard or a credit card. At the theater, the entry scanner went through a routine I had seen at many theaters - she had to turn her scanner so it could read the bar code. Up in the balcony I handed my ticket to an usher. He had to turn the ticket so he could read the row/seat info. He also had to turn on a flashlight since the theater was dim and the TicketMaster ticket copy was very hard to read (I challenge you to dim the lights and then to quickly find the row and seat number on the ticket below). I sat down and started sketching. 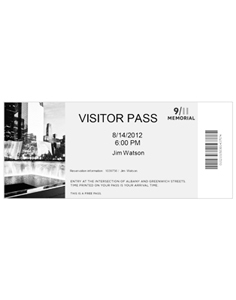 I realized that, with the scanning technology used now, there is no longer a real need for the long rectangular shape and size of the ticket. There had to be a better way. The proposed design is more convenient, safe, allows quicker crowd control, and provides easier entry and seating. 1. Credit card size ticket fits in a wallet or pocketbook and is less likely to be lost or torn. 2. Larger row/seat info is easier to read. 3. Contrast and reversed type allows easier reading in dim light. The section codes (listed below) are easy to learn by ushers. They are based on intuitive logic. 4. Orientation allows more efficient process - the scanner doesn't have to turn the scanner nor the ticket. The usher doesn't have to turn the ticket around or over. 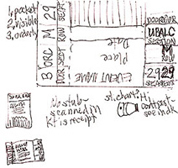 The proposed layout allows the scanner and the usher to read the ticket info no matter how the customer presents the ticket - the front and back have identical row/seat info and the two ends of each side are identical. Neither the scanner nor the usher would ever have to turn a ticket over or rotate it to get to the bar code or row/seat info. 1. The customer reads the ticket to double check the date and time and later to see which door or gate to enter. 2. 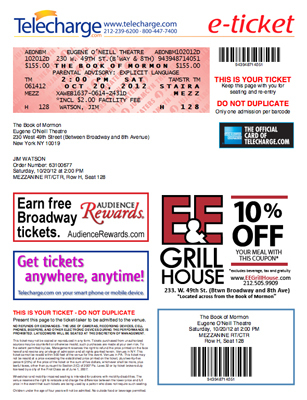 At the theater, the customer shows the ticket at the entrance where an employee with a scanner scans the ticket. 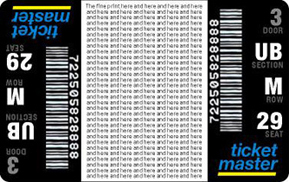 Since the bar code will always be in the same relative location on the ticket, the scanner won't have to search for it, they can just scan the entire end of the ticket. 3. At the aisle, the usher can easily see the white info - double checks the section and then spots the row and seat number. • The NYC Transit MetroCard that is credit card sized and fits in my wallet. I had just used it to get to the theater. • An earlier ticket redesign I did for Mitchell Hall in Edmond (see below). • The dollar bill redesign that was identical when rotated or turned over (more). • Watching the frustration on the faces of the scanners and ushers. • Exploring ways to allow the entry line to move faster and more efficiently. Mitchell Hall on the UCO campus is a 1920s era theater used for drama, dance, and music, lectures, and speakers events. Above is a sample of a1993 ticket. Notice the small size of the section, row, and seat number. Below is a proposed version that is clearer. 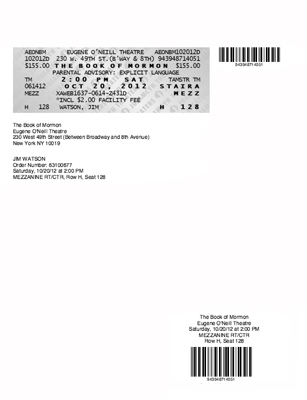 The text copy on the back of the ticket is the same as on the back of the existing ticket. • Larger text copy for the seating info. • Reverse (white on black) seating info for easier reading in the dimly lit theater. • Identical halves so the usher can view either end - no need to flip the ticket to its proper orientation. 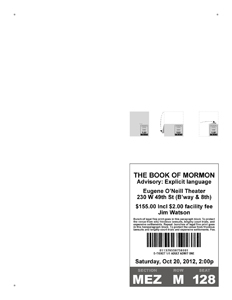 So far, no ticket scanner has questioned the somewhat-blank page. And I doubt they will - their scanner reads all the info it needs and the scanning person is free to move on to the next person in the crush of entering patrons. 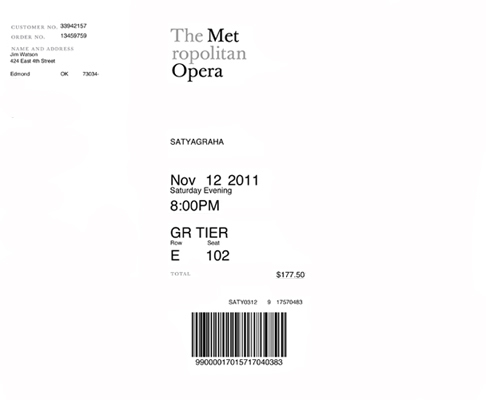 The ticket below for the Met Opera is a much better design - no color and no ink-wasting ads and easier to read copy. But, I still reduced the black ink used by deleting the promo copy and redundant info. 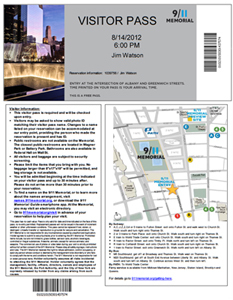 Below is the eTicket for the 9/11 Memorial at the World Trade Center. I deleted the fine print, the map, and decreased the saturation and contrast to minimize the black toner. I folded the page in thirds so the scanner person and other ticket checkers would not see the missing pieces. It worked well. Not even a second glance. 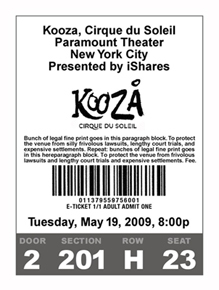 Telecharge, as in the sample above, simply scanned the traditional print ticket and put it into a digital format. Designers should design for the new medium, not just adapt from a former one. I was first exposed to this design principle, design for the medium, by Mary at Brookhaven College in the early 1980s. The college had hired me to develop some interactive programs for teaching art principles. Mary discussed with me that I shouldn't take existing lessons from textbooks and display them on the screen. Rather I should understand the new medium (an Apple II computer) and its capabilities and design to fit that. What a great lesson. Thank you, Mary! • Easy to understand, use, and carry. • Maintain some connection to a printed ticket for familiarity and improve acceptance. • Print seat info to be easily seen in darkened venues. • Require minimal toner to be used. 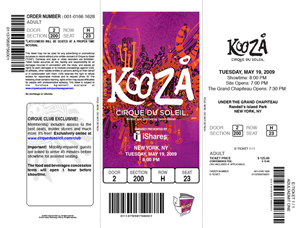 • Design ticket to print on standard 8.5 x 11 sheet of paper. • The folding instructions allow the page to transform to a more convenient pocket-size. The folding is simple - fold the page in half, twice. There is no need for dotted lines or guides on the page since it is easier to just align the corners and fold in half. 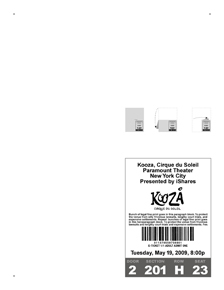 • The dots in the corners serve to help center the page image in the print dialog box. • All the info is in 1 color, to save the color cartridge. Minimal copy helps save the black cartridge. • The seating info is at the bottom so it can be thrust toward the scanner/usher. 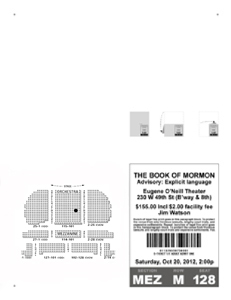 • Easy to find and view seat info, even in low light. Large seat, row, etc. numbers; set reverse (light on dark). There could be two versions: a printer-friendly version and a souvenir keepsake version with full-color graphics. The space on the page can be used to disseminate more information: directions to venue, seating chart, rules of the venue, and sponsors of the event. Some people buy their ticket weeks in advance and may forget exactly where their seat is. Out-of-town tourists might appreciate info on directions and parking. All the additional info should still be in black only with minimal line.